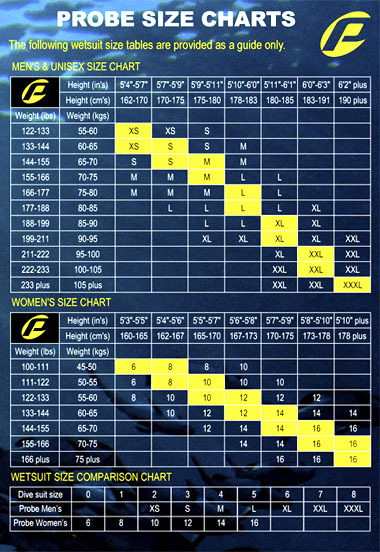 Check your size on our wetsuit size chart. If you are still not sure send us an email with your height, weight and any other useful sizing information such your clothing size and the size of any wetsuit you have used in the past and we will be happy to help you select your correct size. The size chart can be used for both Probe and Frogskins products. Once you have selected your style and size, click on the ADD TO CART button. Once you have finished shopping, click on the CHECKOUT button. You will then be taken to our REGISTRATION page. Here you will be required to register your details for the purpose of processing your order. Once you have completed your registration, click on the REGISTER button. You will then be taken to an authorized secure PAYPAL site for final confirmation and payment of your order. Here you can pay for your order using your Paypal account or if you don't have a Paypal account you can simply pay with your credit card or debit card. Your order will be shipped to any country using TNT EXPRESS COURIERS. Your order will be shipped directly from the Probe Wetsuits warehouse in Australia so please allow between 3 to 7 days for delivery pending on your location and proximity to Australia. A flat rate shipping charge of only AU$29.95 will be automatically added to the total cost of your order at the checkout. We recommend that you provide an address where someone will be available all day, as the package will need to be signed for. PLEASE NOTE: PROBE WETSUITS WILL NOT BE RESPONSIBLE FOR ANY DUTIES, TAXES OR CUSTOM FEES UPON ENTRY OF THE GOODS INTO YOUR COUNTRY. If you are not 100% satisfied with your purchase for any reason, simply return it to us within 14 days at your expense and we will refund the purchase price in full. Wetsuits returned for a refund must be in as-new condition, not used, worn in water, marked or damaged. Please follow our Return Policy procedure before returning your wetsuit. Returns that do not follow this procedure may not be accepted. If you happen to order the wrong the size and would like to exchange it for a different size, simply return it to us within 14 days at your expense and we will send your replacement size free of charge. Your FIT GUARANTEE is limited to one FREE SIZE EXCHANGE per purchase only. For any additional size exchanges the cost of shipping ‘both ways’ will be at your expense. For wetsuit repairs, please follow our Return Policy procedure. Your wetsuit will be repaired and returned to you as soon as possible, if covered under the 12 month warranty period this service is free of charge. To return your wetsuit for refund or size exchange, you will need to obtain a Return Authorization Number (RAN) in advance within 14 days of receiving your wetsuit. Wetsuits returned for a refund or size exchange must be in as-new condition, not used, worn in water, marked or damaged. 1. Send us an email and let us know the reason for your return and we will issue you with your RAN. During this contact, we will provide you with our delivery address and shipping options for your return. Any unauthorized return may be returned to sender. An order can be cancelled within 24 hours, however if the order has already been shipped, you will be liable for it until it has been returned to us as outlined in our Return Policy. If you wish to cancel an order that has already been processed and shipped, you will need to return the goods at your expense when they arrive. In short, everything that you share with us remains strictly private - we do not share or sell information to third parties, nor use personal information for any reason other than its intended use of processing your order. Probe Wetsuits does not have access to your credit card information. Your credit card information, which is only used for processing orders, is kept in a secure encrypted format by Paypal Inc only. If you have any questions about any of our products or need some help with sizing, please feel free to contact us.